A few more new goodies that I checked out the other day. Trying to wear the last of my winter stuff - a few things barely got worn this winter with the warmer temps. Love all the color and print that I am seeing! 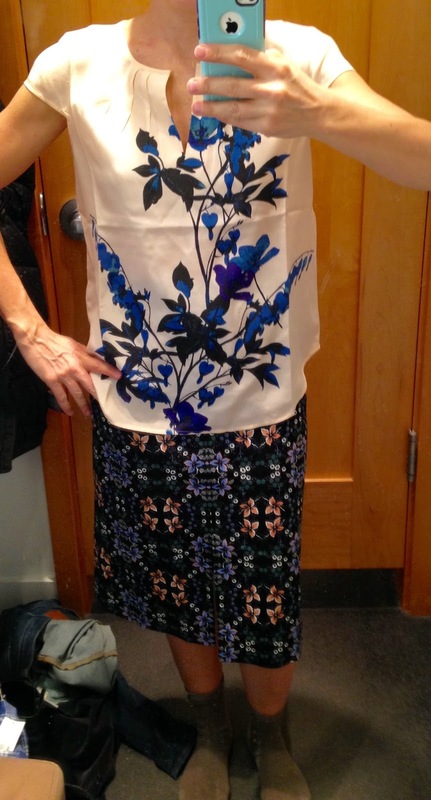 A-line Midi Skirt in Mirrored Floral (size 0) Currently $59.99 before promo! The base color of the blouse is sort of beige-y. It's a nice color but not good on my skin tone. 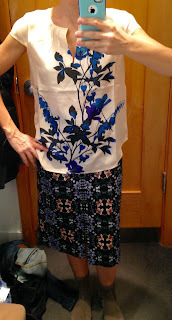 The print is quite lovely and the cap-sleeves are flattering. I think I would need at least a 0 so take the smaller of your two sizes. The skirt I've tried on before. I love this print but the length of this is no good on me. Plus the 0 is too tight and the 2 is too big. Often my problem this year at JC. 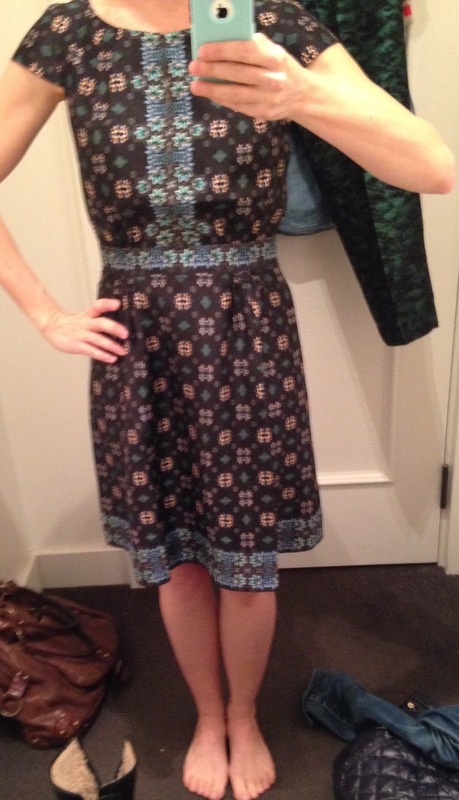 I forgot about the dress version of the print and was glad to see this - clearly an online return. It's really lovely - my usual fitted dress size of 2 felt just slightly too big. Really it was the fact that the top had a little too much blousiness - not enough to fold over and too little to lay flat. The silk is lovely and the border pattern is beautiful. I don't really need anything like this right now but it is a nice dress. Perhaps a little young for my taste. Chambray! I really love this chambray shirt. It is a bit more shaped than most (I recently tried on this Madewell one and while I really liked it, it is a bit on the boxier side) and the wash is just the right color. The shorts are adorable - loved the fabric - a bit thicker which I like because it hides a few lumps and bumps. I usually take a 2 in shorts because I don't like them to be too tight and I would definitely want to go up to the 2 in these. The 0 'fit' but who wants shorts that ride up all day? I'm LOVING some of J Crew's other shorts and can't wait to try on these, these and these! Plus I just ordered these from BR so I hope I like them! Anyway, back to the chambray! I sized down in this one and I really love the fit in the 0 - nice and slim. Unfortunately, it keeps on getting excluded from promos but I am convinced that it will be included at some point. Really cute and will scratch that chambray itch I've had for a while. What's your favorite chambray shirt? What are you liking from the spring offerings at JCrew?